Most of the time I look for exciting and unique recipes to share with you all, but sometimes I realize that it is important to bring it back to the basics. I forget to share my tricks of the trade with my readers, which has made me add a new component to Savour the Senses. I am going to begin doing how-to posts occasionally for simple techniques that not everybody may know about. 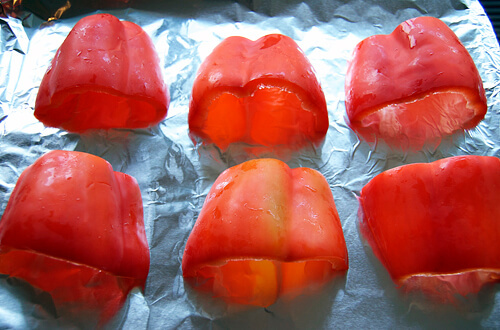 Today I am going to share my way of roasting red bell peppers. Once you know how to roast your own, you will never have to buy those expensive jarred ones again! I think that my way is much easier than the other techniques I have heard of or tried. My technique leaves less of a mess a and doesn’t involve open flames. These roasted peppers are great to freeze for later use too. I would love to hear your thoughts or other techniques! 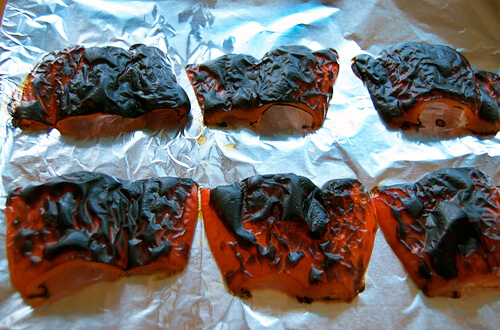 Preheat your oven broiler and place a rack on the highest level. Cut the tops off all of the peppers, then cut each in half through the stem. Remove the seeds and veins before roasting. 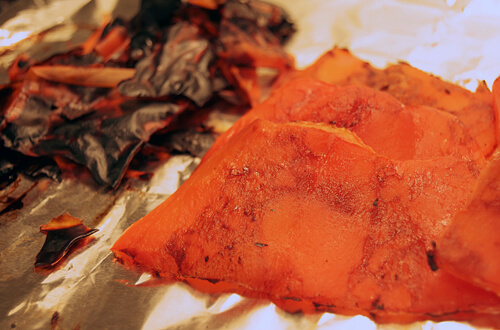 Wrap a baking sheet in foil, then place the pepper halves skin side up on the foil. Broil until skins are completely black. Place the peppers in a zip-lock bag and seal to steam (about 5 minutes). Remove the peppers from the bag and peel away the skin. Freeze for later use or refrigerate for use. Jenny, your method is a lot faster than the usual oven roasted way. Nice of you to share your tips and techniques — much appreciated! Sprouts has beautiful red peppers on sale this week 3 for $1, they will be roasted this afternoon!